Abstract: Up until just a short few years ago, microwave and millimeter wave nondestructive testing and evaluation (NDT&E) techniques were referred to as “emerging techniques”. It has taken more than three decades of sustained efforts in this area to advance the capabilities of these techniques and bring them out of the peripheries to where they are increasingly accepted and applied. Microwave and millimeter wave signals span the frequency range of ~300 MHz to 300 GHz, corresponding to a wavelength range of 1000 mm to 1 mm. Signals at these frequencies can easily penetrate dielectric materials and composites and interact with their inner structures. This allows for evaluating materials properties of complex dielectric composites (i.e., materials characterization). In addition, the relatively small wavelengths and large bandwidths associated with these signals enable production of high spatial-resolution images of complex and critical structures. This can be achieved using a multitude of methodologies including wideband synthetic aperture radar (SAR) imaging specifically optimized for NDT&E applications. Although the contributions of these techniques to the NDT&E fields have been comprehensive and significant on several fronts, three specific and critical areas have particularly benefited from these advancements, namely: i) dielectric materials characterization, ii) multi-layered composite inspection and iii) high-resolution, real-time and 3D imaging. These three specific areas address a collection of broad and significant needs in the NDT&E fields. In some cases, certain uniquely advantageous features of these techniques make them “the method of choice”. This is particularly true for many practical problems pertaining to the inspection of space, aerospace and civil infrastructures. Moreover, recent advancements in high-resolution, real-time and portable imaging system development have facilitated exciting potentials for biomedical applications related to diagnosis of human skin injuries, namely; burns and cancers. These developments have necessitated significant electromagnetic modeling efforts (i.e., analytical, numerical and empirical), in conjunction with designing and developing unique measurement systems. This presentation provides an overview of these techniques, along with illustration of several of these relevant examples. 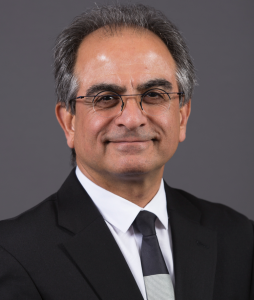 Bio: R. Zoughi received his B.S.E.E, M.S.E.E, and Ph.D. degrees in electrical engineering (radar remote sensing, radar systems, and microwaves) from the University of Kansas where from 1981 until 1987 he was at the Radar Systems and Remote Sensing Laboratory (RSL). Subsequently, in 1987 he joined the Department of Electrical and Computer Engineering at Colorado State University (CSU), where he established the Applied Microwave Nondestructive Testing Laboratory (amntl). He held the position of Business Challenge Endowed Professor of Electrical and Computer Engineering from 1995 to 1997 while at CSU. In 2001 he joined the Department of Electrical and Computer Engineering at Missouri University of Science and Technology (S&T), formerly University of Missouri-Rolla (UMR), as the Schlumberger Distinguished Professor. His current areas of research include developing new nondestructive techniques for microwave and millimeter wave testing and evaluation of materials (NDT&E), developing new electromagnetic probes and sensors to measure characteristic properties of material at microwave frequencies, developing embedded modulated scattering techniques for NDT&E purposes and real-time high resolution imaging system development. He is the author of a book entitled “Microwave Nondestructive Testing and Evaluation Principles”, and the co-author of a chapter on Microwave Techniques in an undergraduate introductory textbook entitled “Nondestructive Evaluation: Theory, Techniques, and Applications”. He has been the recipient of numerous teaching awards both at CSU and Missouri S&T. He is the co-author of over 620 journal papers, conference proceedings and presentations and technical reports. He has eighteen US patents to his credit, with several awarded internationally and several others pending. He was the recipient of the 2007 IEEE Instrumentation and Measurement Society Distinguished Service Award, the 2009 American Society for Nondestructive Testing (ASNT) Research Award for Sustained Excellence, and the 2011 IEEE Joseph F. Keithley Award in Instrumentation & Measurement. In 2013 he and his co-authors received the H. A. Wheeler Prize Paper Award of the IEEE Antennas and Propagation Society (APS) related to the design of 24 GHz real-time microwave camera. He served as the Editor-in-Chief of the IEEE Transactions on Instrumentation and Measurement (2007-2011) and the President of the IEEE Instrumentation and Measurement Society (2014-2015). Currently, he serves as the Chair of the Board of IEEE International Instrumentation and Measurements Technology Conference (I2MTC). He has served on the IEEE Technical Activities Board (TAB) Publications Services & Products Board (PSPB) (2015, 2017-2019), was elected as an at-large IEEE PSPB member for two terms (2016-2018 & 2019-2021) and is a member of the IEEE Xplore Platform Guidance Group. He is a Fellow of the Institute of Electrical and Electronics Engineers (IEEE), a Fellow of the American Society for Nondestructive Testing (ASNT).